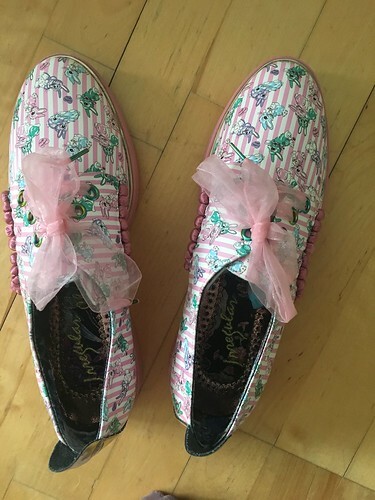 t*rexes and tiaras: Sunday Shoes 145.. I'm not sure what's come over me lately, but I seem to be branching out a little bit. 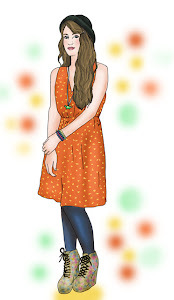 Instead of sticking solely to high heels, I've been favouring flats. 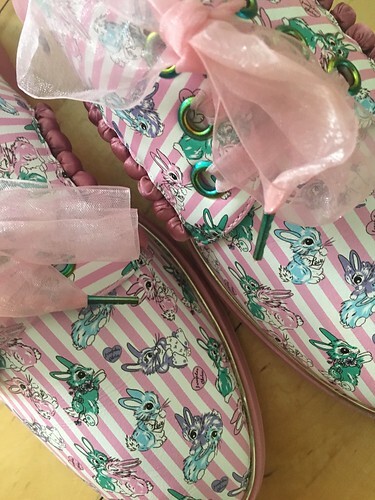 In fact, in the last Irregular Choice sale, I ordered three pairs of shoes....and two of those were flats. 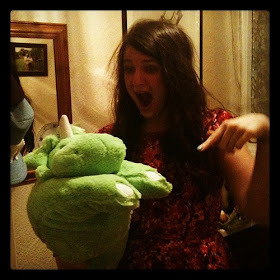 One of them was these. These Buck Brogues are just adorable and so chock full of detail. 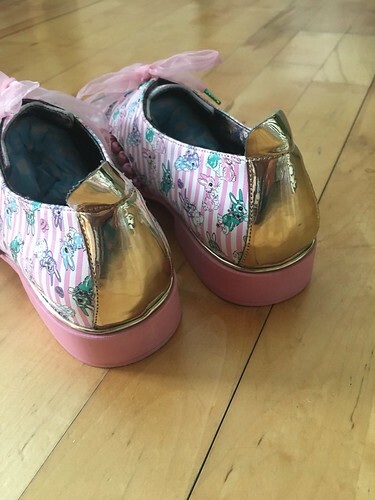 The uppers are a candy stripe pleather with pastel coloured bunnies printed on them and the soles are thick pink rubber, with matching rabbit print, and a gold trim. 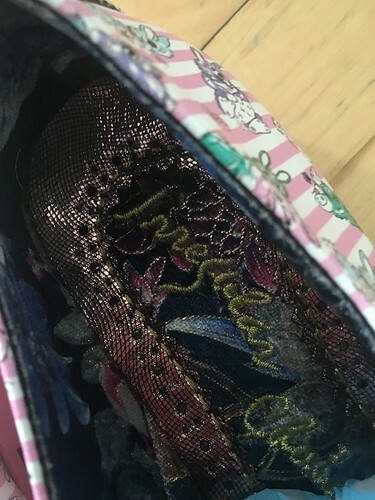 Inside the shoe is the embroidered IC logo we've come to expect lately, on a floral metallic print leather and fabric combination. So shiny, and so comfortable. 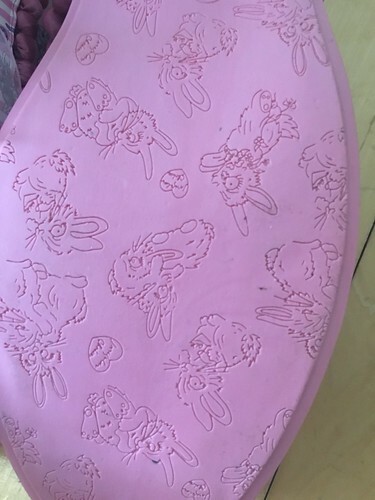 The brogues are also trimmed with a row of little pink bobbles and the tongues are shaped to look like ears. These are not only true to size (I took my regular size in these and was right to do so - can be a bit of a gamble), but also so incredibly comfortable to wear. I'm off for a weekend away soon and plan to pack these as I know I have a lot of walking to do and these will be perfect. 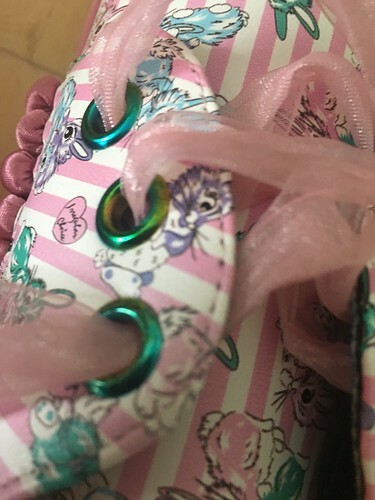 The shoes fasten with laces made from pink organza, which is laced through beautiful iridescent eyelets which match the colours of the bunny print. So cute. I'm certainly back on the bandwagon with IC. This season they seem to be bringing out sooooo many absolute gems and I have a wishlist as long as my arm. I love the type of shoe and the chunky heel although the colour is not me. They have lots of pretty details. I look forward to seeing what else you ordered!